Around 20 Old Hymerians met at Hull Golf Club on 27th June for the annual summer fixture playing for the four golf trophies. On a glorious evening on the immaculate Kirk Ella layout, the fairways were bouncy and the greens were slick leading to only two scores under par. Allan Craig took the Veterans Trophy (over 65) with an excellent 35 points, three clear of John Canby. 41 years after first winning the second division cup, Edward Clark claimed the Palmer Trophy (handicaps 18-28) with 35 points – four clear of Percy Little in second. The best score of the day was John Britton in the first division (scr-18). John’s 43 points took the Chambers Cup by five from Nasim Sharf. The Scratch Cup once again went to Mark Bentley who edged out OH President Jonathan Clark with a splendid gross 70. John Canby, once again, organised the event superbly, but was disappointed by the turn out. be drawing more numbers!! Dates of future events will appear on the OH website. The Old Hymerians scratch golf team returned to Fixby Hall in Huddersfield on 20th May and survived a countback with Bury to finish 5th and take the last qualifying spot for the finals in October. Captain and OH President Jonathan Clark put out three strong pairs with plenty of experience around the tough course whose rough was particularly penal after all the wet spring weather. The fairways and greens were firm and some fiendish pin positions made for some tough scoring conditions. The youngest of the three pairs (by a long way! 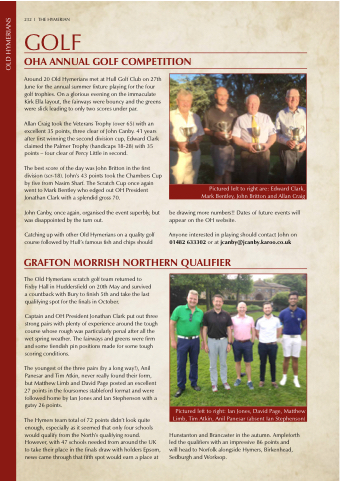 ), Anil Panesar and Tim Atkin, never really found their form, but Matthew Limb and David Page posted an excellent 27 points in the foursomes stableford format and were followed home by Ian Jones and Ian Stephenson with a gutsy 26 points. will head to Norfolk alongside Hymers, Birkenhead, Sedburgh and Worksop.